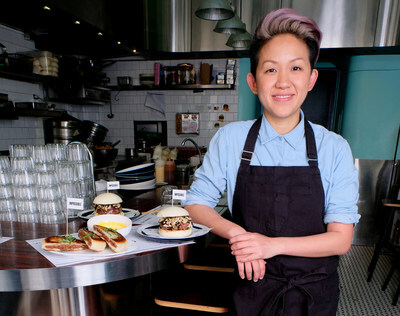 HONG KONG, April 19, 2018 /PRNewswire/ -- The Impossible Foods is launching its award-winning plant-based meat in Hong Kong at some of the city's most beloved restaurants: Little Bao, Happy Paradise, and Beef & Liberty. Ranked one of the world's top culinary hotspots by Conde Nast Traveler, Hong Kong is the first place outside of the United States to feature the Impossible Burger, which cooks, smells and tastes like ground beef from cows but is made entirely from plants. The Impossible Burger is served in more than 1,400 outlets in the United States -- from award-winning restaurants to mom-and-pop diners to the nation's original fast-food chain, White Castle. The vast majority of these restaurants serve the Impossible Burger on a bun with traditional condiments and sides. 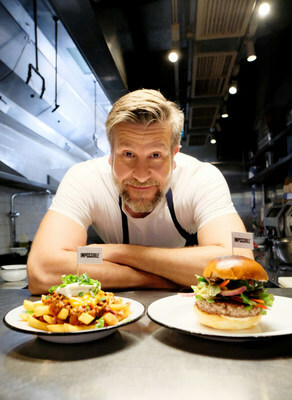 Starting tomorrow in Hong Kong, diners will be able to try the product as a traditional burger -- and as the central filling of savory street food. "We're humbled to launch with spectacular chefs in one of the world's most dynamic restaurant hotspots," said Brown, CEO and Founder of Impossible Foods. "We're confident that Hong Kong -- Asia's crossroads of ideas and influences, both modern and traditional -- will be home to the most innovative Impossible recipes yet." Starting today, the Impossible will be available in Hong Kong on a limited and exclusive basis through Classic Fine Foods -- Asia's leading importer and distributor of fine foods. The group specialises in sourcing, importation, storage, marketing and distribution, and has been operating throughout Asia and Europe since 2001. In development since 2011, the Impossible Burger debuted in July 2016 at Chef David Chang's Momofuku Nishi in Manhattan. The Impossible Burger is the only plant-based burger to win a 2017 Tasty Award and a 2018 Fabi Award from the National Restaurant Association. In addition to the American fast-food chain White Castle, The Impossible Burger is the only plant-based burger featured in America's most beloved "better burger" concepts Fatburger, Umami Burger, Hopdoddy, The Counter, Gott's and B Spot, the Midwest burger restaurant owned by Chef Michael Symon. The Impossible Burger is made from simple ingredients, including water, wheat protein, potato protein and coconut oil. One special ingredient — heme — contributes to the characteristic taste of meat and is the essential catalyst for all the other flavors when meat is cooked. Heme is an essential molecular building block of life, one of nature's most ubiquitous molecules. Although it's found in all living things and in virtually all the food we eat, it's especially abundant in animal tissues. Impossible scientists discovered that it's the abundance of heme in animal tissues that makes meat taste like meat.